My wife and I sat down tonight to watch the classic movie "The Great Outdoors" with John Candy and Dan Aykroyd. The movie takes place in "the north woods." It isn't clear exactly what that means. They mention Minnesota, Wisconsin and Michigan. The family is from Chicago. There is one mention of one of the characters being one of the oldest men in Canada so perhaps they are just over the border. I liked that the owner of the resort wore an "I've been to Duluth" t-shirt. Of course, you can buy one online. The film has lots of bears in it and they switch between grizzly bears and black bears as though they are all the same. That didn't bother me as much as the birds though. Where on earth did they get these? I'm a total dork so I went through the film and did screen captures of all the birds that appear. Please please correct me if I'm wrong gentle readers but isn't that a Red-crested Cardinal? You know, that common species from South America! Hell they don't even have Northern Cardinals in the Boreal forest let alone these guys. 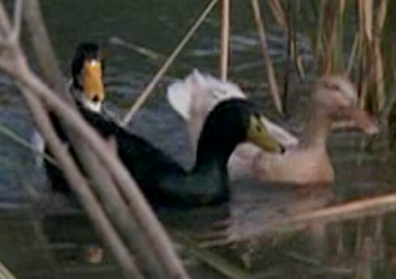 Okay, how about these ducks swimming in the lake during the water skiing scene. They must be authentic, I mean, anyone can find some Mallards to take shots of right I mean, oh no...what the hell are those? Those are domestic ducks. The dark one on the right looks like a Cayuga duck which is a breed of domestic duck that was developed from wild mallards. This one looks like a male. Note the curled feathers on the tail. The really weird looking duck on the left is also a domestic duck. It is an Indian Runner Duck which comes from, well, India and not the Boreal Forest. Sharp-eyed observers will notice a third duck behind the Cayuga. It is pretty plain except for the white tail. I have no idea what breed it is. Nice of the filmmakers to go to the trouble of re-creating the great northern forest. Of course, what Boreal lake is complete without a flock of domestic Graylag geese? The Great Outdoors is a great movie but Hollywood is pretty pathetic when it comes to their choice of animals in films. Maybe most people won't notice but it takes so little effort to get it right. My favorite part about the show "Men in Trees" was an episode about a particular plant that led them tromping through the woods to find it. In their botanical adventure they had many "stand-ins" for well-known Alaskan plants. All wrong. My favorite part about this comment: the verification word is "mooper." Well plants I can at least kind of give people a pass on since a lot of movies don't have the budget to go exactly where they would like to and they have to settle for a place that has the right "feel" if not the correct species. I can also cut some slack for the same reason when people are supposed to be in Turkey or somewhere and you can hear southern California birds in the background. These are a function of location. These animals were clearly brought in so they could take shots of them. 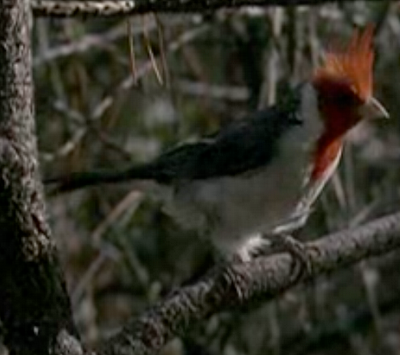 The geese and the Red-crested cardinal both appear in the opening credits specifically to establish the scene that these people are in the boreal forest. Just bizarre.